I love these stories. This story is about discipleship, a word that is before English translation of the Bible or even the written Word itself, but the concept is here. We might call it protégé. It happens right after Elijah the prophet defeats the 450 prophets of Baal on Mount Carmel and after he then runs from Jezebel. It is after he has a pity party and then the Lord cares for him, protects him and strengthens him. Now, Elisha appears on the scene – in the very next few verses. In I Kings 19:21 it says, “Then he [Elisha] set out to follow Elijah and became his attendant.” Some translations called him “assistant,” some “servant.” The idea is the same. Elijah found Elisha, called him and Elisha burned his bridge to his livelihood and followed Elijah. 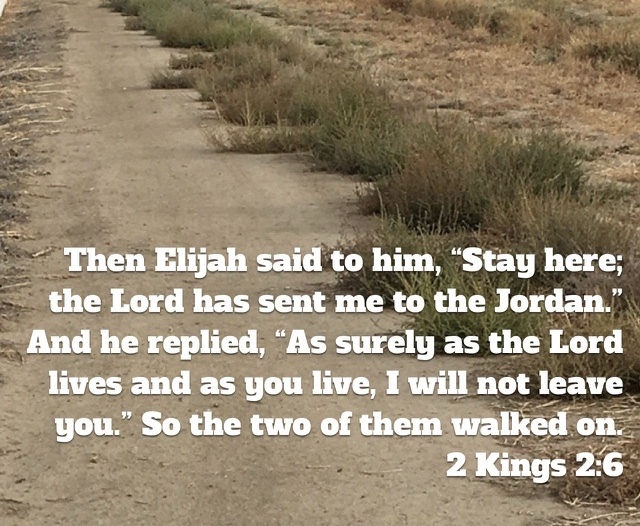 In this later verse, Elisha would not leave Elijah. He wanted more of what Elijah had. He was zealous about receiving from Elijah. When Elijah realized that Elisha was going to stay with him, the two of them walked together. Serious discipleship. Call it mentoring. It takes both one to teach, mentor, discipleship and one to be committed to following. How serious am I about receiving from someone who can teach me? How serious am I about passing it on? Then who? Paul talks about entrusting “to reliable men who will also be qualified to teach others.” (2 Timothy 2:2) He also talks about teaching the older women to so live that “they can train the younger women….” (Titus 2:3-5) Much to learn. Much to be taught. Show me, Lord, who? A couple of months after Jim and I completed the Walk across America, I began to go through the Bible, searching for the word “walk.” As I have been reading these passages, I have found within the Scriptures and within my own heart and mind, that there is so much more to walking than physically walking anywhere – whether across America, across the street, or anywhere else.